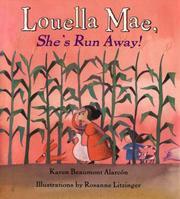 Children's Picture Book Database at Miami University | Louella mae, she's run away! Louella mae, she's run away! Louella Mae has disappeared and her family goes on a wild search around the farm to find her. At the end, not only is her location discovered, but also the fact that Louella Mae is really a pig! Alarcon, Karen Beaumont, “Louella mae, she's run away!,” Children's Picture Book Database at Miami University, accessed April 20, 2019, https://dlp.lib.miamioh.edu/picturebook/items/show/8770.